This article is based on original information received by the authors who worked for many years as anthropologically trained psychiatrists in the Pacific Northwest among the Coast Salish Indian people and their neighbours, and on relevant ethnographic reports going back to the time of early contacts in the 19th century. The authors attempt an analysis of Coast Salish shamanic ceremonials practised in the past in the context of the North American Indian guardian spirit complex, and revived in modified form in the 1960s as psycho- and sociotherapeutically effective winter spirit dance ceremonial. 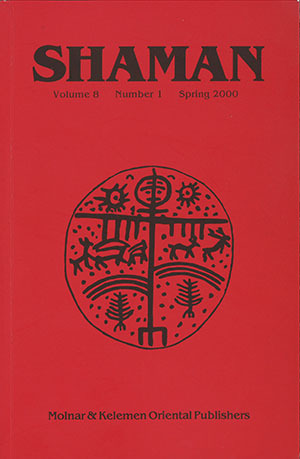 The analysis is conducted on the level of symbolic content and on the level of formal structure; it encompasses the symbolic process of the spirit dance initiation, of the Coast Salish mask myths and dance ritual, of shamanic “Indian Doctoring”, and of the “Power Board and Pole” ceremonial which derives from the now obsolete shamanic spirit canoe rite. The fundamental premise of this paper is that there exists a single, highly complex, common neurocognitive capacity responsible for the development of many uniquely human cognitive and cultural phenomena, including shamanism, the shamanistic worldview, art, and language. This essay is representative of a work in progress aimed at initiating the scientific exploration into this primary human neurocognitive faculty, identified and referred to herein as ‘imagination’. The task however, is monumental. Not only is the study of imagination lacking in the Western intellectual and philosophical tradition, but this very tradition is founded “upon a widely shared set of presuppositions that deny imagination a central role in the constitution of rationality” (Johnson 1987). The viewpoint adopted in this inquiry departs quite radically from this convention. Herein imagination is considered to be a fundamental and essential human mind-brain function, and shamanism is one of the most dramatic and first recorded manifestations of this cognitive faculty. The purpose of this paper is twofold. First of all, as its title suggests, its aim is to be a preparatory neurocognitive investigation into shamanism and related phenomena, a field of study all but ignored by the neural sciences at large. In this regard, it is intended to introduce a theoretical structure upon which two traditionally disparate fields of inquiry – namely the study of shamanism (and related phenomena) and the field of cognitive neuroscience – can lend to and share with each others – respective spheres of knowledge. Also, by introducing shamanism within the same context as language and suggesting that both share a common neurocognitive foundation (imagination) it seeks to further legitimize the neurocognitive exploration of these types of phenomena. Secondly, this essay identifies imagination as the essential neurocognitive faculty that is both manifested by shamanism and gives rise to it. Thus, it intends to lay the foundation upon which a neurocognitive approach to the study of shamanism, as well as trance and other related phenomena at large, can be built by defining a new field in cognitive neuroscience: the study of imagination. This paper demonstrates that the universal “pattern” of passage rites manifests itself in oriental shamanic rites of calling back the dead. These rites would appear to fall under the Buddhist rubric of moshu, or “wrongful clinging”. The same notion appears to have its analogues in the dramatic action of No, which, however, depicts characters anxious to give up this “clinging”. It is these whom the audience can identify with. The comparative approach adopted involves the action, forms of dialogue and the strangely shifting nature of character which is common to both the shamanic ritual and the drama. Both these forms of activity appear, broadly speaking, to exorcise bad spirits by making them into good ones. No in effecting its cure emphatically engages in tacitly upholding the most transcendental Buddhist precepts; the ritual appears to exist happily where it is needed, and where alternative forms of drama are not yet powerful or appealing enough to supplant it. Scholarly investigations in the last decades have produced a great variety of suggestions and hypotheses concerning” the shamanic substratum” of Chinese culture. These studies have most often applied a diachronic, i. e. historical, archeological or philological method to investigate the presence of shamanism in the Chinese religious landscape. However, beyond the filed of Sinology, the conclusions of these recent studies are not widely known. On the other hand, not even Sinology has made an attempt comprehensively to treat the origin and the development of this presumed substratum. In the next few pages, I will summarise the main hypotheses and evidence of shamanic influence on the Chinese religions complex, contending that a more detailed analysis and a through reassessment of classical sources will later be needed further to clarify some of the unknown aspects of shamanism in ancient China. The study is done in a little known ethnographic area, Sabah, at least in the field of indigenous shamanism. What is perhaps fascinating is that the three shamans studied in relation to Murut shamanism do not merely exercise traditional roles but also engaged themselves in public subversive activities. This study proposed to see shamans as the existential and human symbols of the local practice of shamanism. In addition, this study established the “perspectival difference” (even among Muruts themselves) between the perceptions of Muruts who have “heard of” the shamanic practice and those who are actually practicing Murut shamanism. The juxtaposition of both perspectives in this study is seen as complementary. The practice of shamanism and the shamanic “route” undertaken by the shamans of each culture, and even the manifestation of “subversive memory” by the shamans, have to be seen as context-specific. Indeed, there are differences amidst the similarities in the diversity of shamanistic practices.